Friday, May 19th was a big day for little ol' Opie Taylor. Yes, Ron Howard's cinematic opus opened nationwide amid considerable controversy. Accompanied by Mr. Jerry L. Nelson (whose Haiku Review can be found below), Needtovent made it a point to see THE DA VINCI CODE during its initial matinee screening in New Braunfels, Texas. Upon ariving at the Marketplace Theater I suddenly realized that I had left my trusted Flash Gordon Decoder Ring at home. Needless to say, I was thus extremely concerned that I would be unable to make sense of the highly complex storyline, especially since I had not read the book. My concerns were unfounded. 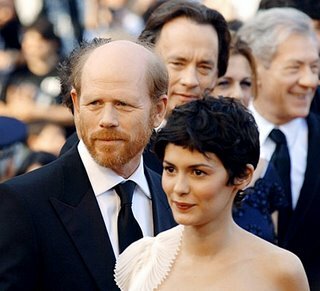 Kudos to Ron Howard. He has brought to the screen a very enjoyable, highly polished motion picture that, despite its approximate two hour thirty minute running time, never becomes dull or boring. And while Tom Hanks was far from the first choice to play the lead (Bill Paxton was the initial choice, followed by several others, including George Clooney of all people), Tom's understated performance is among his finest in recent years. (I'll admit that I was skeptical, fearing something akin to Gump Goes Godly). In fact, the entire cast was terrific. Special mention must be made on behalf of Audrey Tautou, who I first saw in LE FABULEUX DESTIN D' AMELIE POULAIN, aka AMELIE in the US. She is absolutely radiant. Likewise, both Ian McKellan and Jean Reno were perfect for their respective roles.